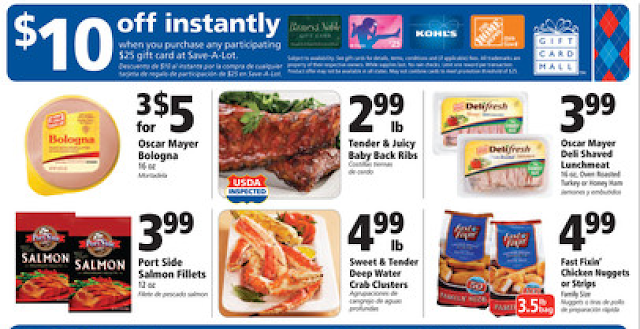 Hot Deal** Save $10 off $25 Gift Cards at Save-A-Lot!!! UPDATE** I did this deal tonight and got 3 Home Depot gift cards for only $45 instead of $75! I had to ask for them because the managers stashed them in their office. They said someone came in to get 100 Home Depot cards. Smart man (or a contractor)! Now the limit is 3 per customer per day. We don't mind. Anything to save a little and get my man going on those woodworking projects! Wow! This is an Awesome deal! Photo From For The Mommas! Get $10 off select $25 gift cards at Save-A-Lot through June 15! So only $15! 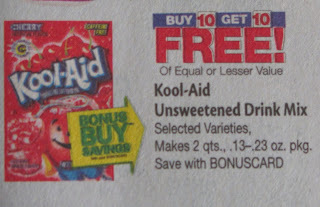 This seems to be a regional deal, so check the local Save-A-Lot circular (it's on page 4). They have gift cards for Kohl’s, iTunes, Home Depot, and Barnes & Noble. Perfect for graduation and Father's Day presents! Check your store. You don't want to miss out on this deal! Thanks to Crystal at MSM and also The Frugal Thrifty Mom for the heads up! HOT**Get $2/Gallon Off At Martin's!!! 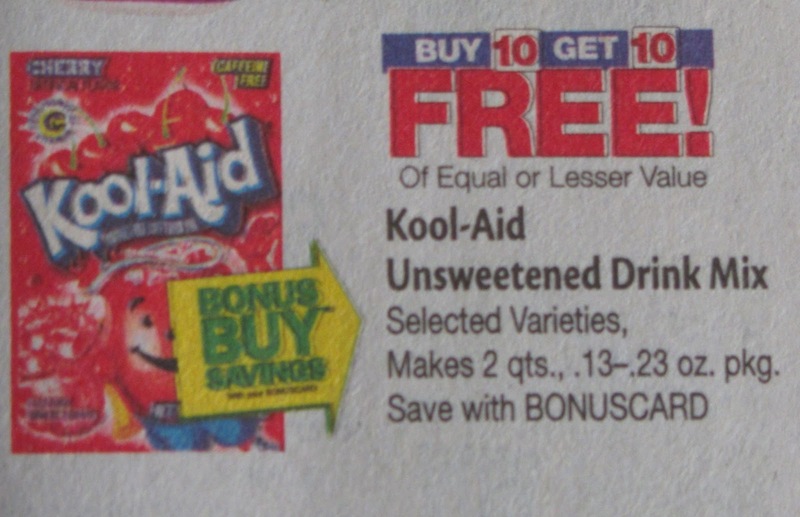 Kool-Aid packets are BOGO $0.25 each, so buy 8, pay $1, get $0.20 off per gallon. The best part is you can do this deal 10 times in one transaction and get $2 off per gas! up to 20 gallons or $40 off at the pump! it is only half of one of these boxes. I made a few trips over the week and was able to do this deal multiple times. There was plenty until Thursday afternoon. They are pretty stingy with rain checks but I got a couple anyway. That way I can still do the deal in July! Besides finishing off a month-long Clutter-Busting Challenge, this week had a few highs and lows. Like going to friends' block party, staying out way too late (a high) then the car battery dying and not getting home 'til midnight (a definite low). I guess the flashing battery light was a true car trouble warning! My husband also changed the alternator himself (a high!) and the vicious mosquitos have begun attacking the kids and I (a real low). We had our annual pool party on Sunday (one more high). Even though the water is still freezing, no child could resist a dip in the pool. It was a great time: bbq sandwiches, mac n' cheese, potato salad, apple cobbler, umm-mmm. Nope, it did not matter that the water was only 60 degrees. We found inexpensive bathing suits at Sam's Club. I bought them during the Sam's Club Open House (free shopping pass!) We also bought a couple of pool toys at the end of the season last year. So except for getting more sunscreen, we are all set for a great summer of swimming. ﻿The children swam 4 times this week already. Not me! The lifeguard said it was too cold for her so that's enough reason for me to stay poolside. I was very surprised to that my children remembered the back float. Isabella even swam freestyle and backstroke! Big Pool = Huge Fun! ﻿I taught them how to swim since they were in preschool. We did not have money for swim lessons but had a pool access in the neighborhood. So, I had to toughen up and get over my fear of water. I watched a couple of swimming tapes from the library, got them some goggles, and months and years of lessons later they can float by themselves! Also, one summer, a friend's teenage daughter gave them weekly lessons. It really helped learning from a cool, big kid! But freestyle and backstroke are all I know. I'm hoping the lifeguard or my husband can teach them (and me) the breaststroke this summer. We shall see! How about you? How has your week been? 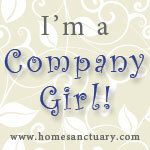 Share and link-up at Company Girls Coffee! Day 31: Final Day of the Clutter-Busting Challenge! This morning I pulled aside 30 VHS tapes. I love cassette and VHS tapes. I think my generation is the last to have grown up in the era of tapes. I love them! They don't get scratched or skip and they last forever. I've wanted to part with all our tapes along time ago but library DVD versions are usually scratched (libraries don't have tapes anymore!) and they aren't on Redbox or Youtube. Solution: Donate to the Community Room. Like our dominoes, we can share these tapes there but always have access to them. Well, I didn't get any more stuff cleared out like I hoped. We went to the pool instead then did the Martin's Kool-Aid deal to get $1 off gas and Target for the cereal deal. Then I made baking mixes and watched part of Time Cop 2 on youtube. This is what makes Clutter-Busting a challenge for me! But we did get rid of 692 items in May! I could not have done that without the motivation from the Clutter-Busting Challenge. Day 21: 160 Books to Donate!!! Day 15: Clothes and Shoes Land in Donation Pile- 42 Items! Day 4 and Day 5 Decluttering: Box Tops, Boxes and Old Timer - 31 Items! 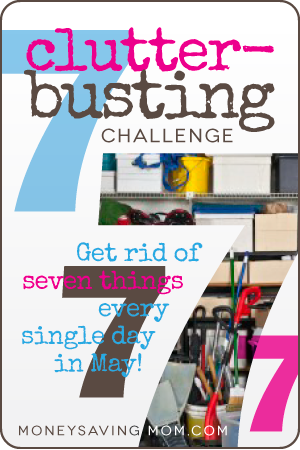 Two more days to this Clutter-Busting Challenge! I got rid of 10 items. A giant homemade 3-d snowflake on the ceiling of my daughter's room has been hanging there since Christmas. I kept forgetting to pull it down. This 3-d snowflake was so pretty and easy to make again that we don't need to keep it. I just remembered today that our neighborhood community room has lots of games, movies and books available for anyone to use. Since we go there often, we can bring our games, books, and movies there to "store". An A-Ha! moment. Technically, we are donating it to the community room. But we can still use it anytime we want as long as no one is using it. Perfect! This is the perfect solution to still get more books out of the house but still have nearby access to them. Possible $4 Money Maker on Neutrogena at CVS! CVS has a great deal on suncare: Buy 2 Neutrogena suncare get $5 ECBs. And it works on the trial size lotions, too! Thanks, Hip2Save for the heads up! I had problems printing the $1 coupon so I didn't have those to use. But had the $2 CVS q, so still $2 MM for me! I also used a $2 Almay q from 5/19 RP and paid only $0.49 for this Almay concealer. For the Clutter-Busting Challenge, I shared that my husband changed our old Jeep alternator and car battery. But not only is he a budding mechanic (at least for Jeeps! ), he is also becoming quite a carpenter. My hubby made this chair for me! Using only 1x4 and 2x4 wood pieces, he followed a pattern from a the 2x4 Projects for Outdoor Living. I think he made a few adjustments, like using a pocket-hole Kreg jig to make it sturdier but pretty much made it like the book suggested. 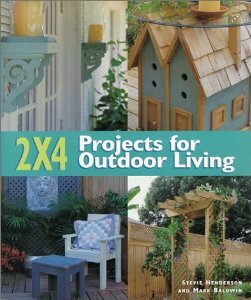 This is a great book for outdoor projects. I found it a while ago at a used bookstore. I do love me some Ana White patterns as well and have prepared a honey-do list of woodworking projects for him this summer. He also made the $10 Book Ledge by Ana White using her pattern. I'll post a picture of that next time! But really, I just needed to let it go. After all, looking up info is what google is there for! I really hope to get more done tomorrow. How is your Clutter-Busting Challenge working out? On Memorial Day, we visited with friends til late night. As we were leaving, the car conked out and Tony, my handy hubs, had to run to Wal-Mart and get a new battery. Yesterday, he also changed the alternator. I am adding that to the de-cluttering list. As you can see the new one the right is super shiny compared to the old one. It was the original from 15 years ago! Did you know that recycling the old parts will give you money back for the core charge of new part? He got $9 back today for recycling it at Auto Zone. As for other de-cluttering, I remembered to get rid of some boxes last night but I didn't pull them out until today to take a picture. The Land O' Lakes hot cocoa is awesome! We have fun "ordering" our flavors. But I didn't really need all the boxes so they got consolidated into a plastic storage bag. Last week my 10 weekly goals did not pan out so well because I missed one important step: Print Out and Display Goals! Since our old printer only works with our old computer, I kept off printing it and forgot about the goals I listed. Not going to happen this time! 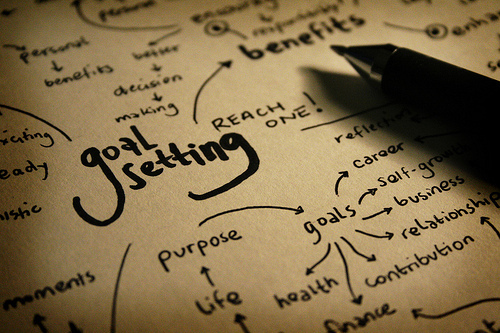 How do you stay on top of your 10 Weekly Goals? I did have a great birthday. We finally had a date; we went to see Iron Man 3. We went to the strawberry patch for at least one nature walk. And I did get a lot of de-cluttering and reading done. For this week, I am continuing much of last week's goals and doing some of what did not get done. Plus the pool is open so swimming is a big priority this week! 1. Continue taking weekly pictures of the children. 2. Take tea and reading time outside. 3. Continue reading Platform and So Long Insecurity. 4. Grandma's Attic as lunch read-aloud. 5. Continue with violin lessons. Start art and swimming lessons. 6. Enjoy following Monday Menu Plan. 7. Go for at least 2 nature walks with the children. 8. Write at least one blogpost a day. 9. Work on Clutter-Busting Challenge, finish strong for last week! 10. Create Summer Bucket List. The smaller 3 oz Jergens Lotions are Buy 2 Get $5 ECBs. The limit is also 8! The Magic Coupon Machine is also printing out a $2 off 2 lotion CVS Q. So... if you can find this many, you could get 16 FREE Jergens lotions plus $0.88 overage! Worried about getting off the Clutter-Busting Challenge wagon? These would be great donations for the women's shelter in your area! *CVS Q from Magic machine printed out Sunday for me. Notes: I used $5 ECBs from the Beauty Club, plus $12 ECBs from last week. So my out-of-pocket expense was only for tax. There is also a $0.70 Kellogg's Q and $0.50 Cheerios Q that can also be used. 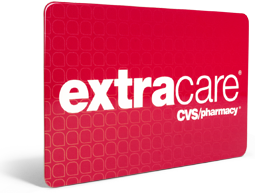 Check out other great CVS deal scenarios to make your CVS shopping even better! *Also, there were lots of $2 Qs on John Freida products like the Sheer Blonde Shampoo above. They are part of the Buy 2 Get $5 ECBs. As with the Jergens deal, there is a limit of 8! Day 26: What to do With Contact Lens Cases? It's the home stretch for the Clutter-Busting Challenge. And after this week's donation bonanza, now, I can focus on one final big sweeping cleanup. June will be a great time to organize. While I have taken the last two weekends off, I did look through our toiletries stash hoping to de-clutter them this weekend. But it was like the same situation with getting rid of our books. It was so hard to get rid of anything. So Saturday was a bust. I did reorganize the toiletries. But I am hoping for another inspiring breakthrough like when we gave away 160 books last week. Last night, I did remember the 7 contact lens cases we have. Only one person wears contacts in our family. The problem is that every new bottle of contact lens solution comes with a new contact case. That's something I just cannot see myself donating to the thrift store or giving to a friend. And I don't think they can be recycled. So, I've held on to them until last night. It's ok to just toss some things and not feel guilty about the environment being messed up. Besides, I can't worry about cleaning up the environment when I can't even keep my own house clean. Can anyone relate? Our menu for the week is again pretty simple. But I am trying out some new recipes for dinner like escabeche. Loved that fried-fish with peppers when I was growing up. I am looking forward to Saturday's FREE Chick-Fil-A breakfast (for wearing pajamas). Have a menu or recipes to share. Link it up with Menu Plan Monday or at Susie's QT Pie Cafe! Before we moved to VA, I already got rid of closets worth of clothes because, having lived in FL 6yrs, how many pairs of shorts does one really need? And now, since participating in the Clutter-Busting Challenge, we've given away even more clothing items and shoes. I had a plan behind that. What we really need is a new wardrobe that better fits our new 4-season environment. Now that I have less of the same things, it was time to get new items that fit better and that will get more wear. I went thrift shopping yesterday at different consignment shops to spend some birthday money. The clothes I saw were very cute but meant for very small people and I don't mean short. I came up empty-handed and started to feel bad about myself. Then I realized that most of those clothes were not my style anyway. I then went to the Goodwill just a few short miles away and boy, it did not disappoint! Having to get rid of so many clothes in the past year, and especially being mindful of clutter in general this month, I became very focused while shopping. My mantra was: "Buy it only if you LOVE it, not like it." Otherwise it's going back to Goodwill anyway for donations. The clothes were organized neatly by color and type. Many items were well-known brand names. Prices were displayed prominently at the end of each rack of clothes. And people shopping there were happy: giggling teens, young grandmas, happy families, even the baby was crying only softly. If the clothes were grouped by sizes too then it would be perfect. Somewhere a long time ago, I read a tip to wear leggings, a tank top and slip-ons or flip flops when thrift-shopping for clothes to make changing easy. It really does work. I was still trying on clothes at the check-out line and found a couple of skirts that way. Just pulled them up over the leggings and went up to one of the mirrors to check the fit. I think I'll stop by at least every few months to add a couple items to build my new wardrobe. The best part is, of course, it is so frugal! Today, I was organizing our toiletries and thought I had more than I did. I guess I need to make a list and do an inventory that I can stick on the inside of the bathroom cabinet door so I know what we have. Even though that was a bust, I did set aside a few samples of laundry care and shampoo/conditioner samples for a friend I'll see this weekend. There were also 4 empty boxes, 3 very old grapefruit in the fridge, 3 expired items to toss. The total for today's Clutter-Busting Challenge is 17 items! Yay! Day 10: Satisfaction Gusrantee on Cosmetics at CVS = Easy Returns! There is nothing like going to a homeschool convention, especially if it is a state convention. I went two years ago to the Virginia homeschool convention in Richmond and it was jam-packed with 11,000 visitors. But last year, due to scheduling conflicts, I could not attend for the whole event. I was able to stop by during the FREE shopping time Saturday afternoon. It was a great way to get all our curriculum. I knew what I wanted to get so I was able to purchase it there and have it shipped for free. So no lugging those huge carts you see at convention around for me. A: Free Shopping is open on Saturday, June 8, from 3 to 6 p.m. ONLY. No registration or fees are required; however you will be asked to sign in at the Exhibit Hall. The Used Curriculum Sale will be closed by that time and is not included as part of free shopping. 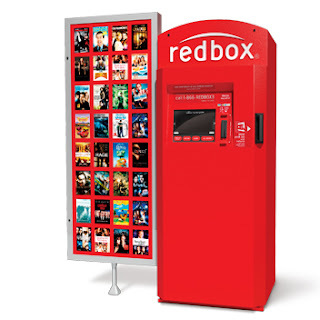 From Sunday, May 26 through Sunday, June 16, you’ll get exclusive Redbox offers right here every week! Visit us each week to get great deals on DVD, Blu-ray™ and game rentals. Strawberry Picking- A 5 Year Dream Come True! This Friday, I'm sharing our strawberry picking trip as my highlight of the week over at Company Girl Coffee. Why we never got together to pick strawberries in May when the temps were more bearable, I don't know. But I always fancied picking strawberries. Maybe it was because of watching Strawberry Shortcake during my daughter's preschool years. But every year, I just plain forgot. When my birthday rolled around this week, I knew the perfect outing for me was picking strawberries as a family. We didn't have much time to pick but it was worth it! Unlike picking apples up in the mountains, all the strawberries are within reach by our feet. It was like an Easter egg hunt. Each bright green leaf revealed red jewels of fruit. Not even the bugs on some of them dampened our spirits. Next time we will come earlier on a cloudy day, wear long sleeves (the leaves make our skin a little itchy), bring a picnic lunch, stay longer to take the free hayride and play in the playground. Strawberry picking will surely be a new springtime tradition. Have you enjoyed u-pick strawberry farms? I always check my local area for seasonal u-pick offerings because it is so much fun! Day 23: Check Behind What Kids De-Clutter! I love how my children have helped me so much with the Clutter-Busting Challenge. They have put a lot of effort to collect items for the church yard sale like magazines, books, stuffed animals, costumes and swords. All I'd have to do was remind them that their things can go to some other child who could enjoy their things and they happily got rid of it. We also made it easier by stacking up magazines and some books in a pile that they could read in a couple of days before donating them. Giving them a chance to read them one more time made it easier to let go. So after dropping off our donations yesterday, I took it easy and my husband encouraged the children to tidy up their room. He put the trash can in there to make it easy for them as they sorted through their loose papers and toys. When I looked in the trash can, however, I found two paystubs and freaked out a little... well, a lot! Apparently, he told them to look around for more things to clean up. But then added, he was also going to personally check-up behind them so I ought to calm down. Whew! They filled up two-thirds of the can so I'm not sure how many items are in there. I've closed the lid for now! Every year, we also participate in Operation Christmas Child by putting together two Christmas Shoeboxes. I got a head start today and set aside 42 items collected over the year and neatly put them in the shoe boxes. Good thing too because now I know we have enough to fill them and I can stop buying little things every time the Target Dollarspot has 50% off sale. It's easy to stock-up between back-to-school, Halloween, Christmas and Easter clearance sales. All in all, there are 42 items between these two boxes, some practical items and lots of very fun items too! Day 22: Mad Rush to Finish Donation Pile By Evening! After much success boxing up 160 books and 18 children's magazines, I realized that I won't even be able to get the donations to the yard sale this weekend. We have to drop them off the same morning of the yard sale and I can't swing it that morning! I called a friend who can take them for me but I have to get it to her today, 3 days sooner than I had planned. So I went on a manic search for clothes and extra things to donate. After pulling out 42 clothes and shoes for donations last week, I gathered more items in a mad one-hour dash to get all the donations together. My friend who is bringing in our stuff to the yard sale told me that a company pays $0.15 per pound for shoes, clothes and stuffed animals. So any of these items that do not sell at the yard sale will be taken here for extra money. Plus that company sends all of these to Central America missions; even soiled or torn clothes are recycled. Amazing to be part of this yard sale! After passing one winter here in the Mid-Atlantic and not using certain coats, I knew we had to donate them. It was pretty tough because I had to get rid of one coat from my dad that he used in his younger Navy days and that I used all through college. Another was the suit my husband wore when we got married that doesn't fit him anymore and my someday jeans that I hoped to fit into this year. I kept reminding myself that someone else can use it, the youth at Church need the money, and Central America missions will be blessed too. So all in all, 32 items were added for donations including: 3 coats, 2 suits, 1 blazer, 2 girl's dresses, 5 pants, and much more. We also gave away our little TV that we got for free 6 years ago. I also gave 7 teacher's guides, 1 reader and 2 workbooks to my friend. She started using Christian Light last year and I offered to let her have some of my teacher's guides. I've wanted to sell these at the used curriculum fair but I wasn't able to go last week so I was going to keep it for next year to sell. How silly of me! Here's a new friend who has done so much for our family this year who could really use these books. That would be a $43 savings for them and I felt really good to give these to a friend rather than making a few dollars selling them. The back of our Jeep was full of donation items. Wish I took a picture of that. I am praying that the yard sale will be a success Saturday! Day 23 was a successful Clutter-Busting workout!